The Tracy family lives on a lush private island in an ultra-chic abode with curved floor-to-ceiling windows overlooking a shimmering ocean vista. There’s a pool with a high diving board and an inviting patio. The home is staffed by an attentive Japanese butler in traditional garb who is a terrific cook, though Grandma likes to dabble in the kitchen. The spread is a marvel of modern architecture, a veritable vacation home for jet-setters. Papa Jeff Tracy and sonny boys Virgil and Scott Tracy of International Rescue. The father, Jeff — a fit, silver-haired former astronaut — stays home and monitors the missions of his five adult sons. Scott, John, Virgil, Gordon and Alan each have a specialty. (I don’t want to cast aspersions on Jeff’s late wife, but his sons look like they all have different fathers.) There’s a hanging portrait of each son; when one of the boys reports in from the field, the eyes light up on the portrait, which turns into a video screen. Alan, Gordon and John Tracy of International Rescue. They, ahem, all have the same parents. 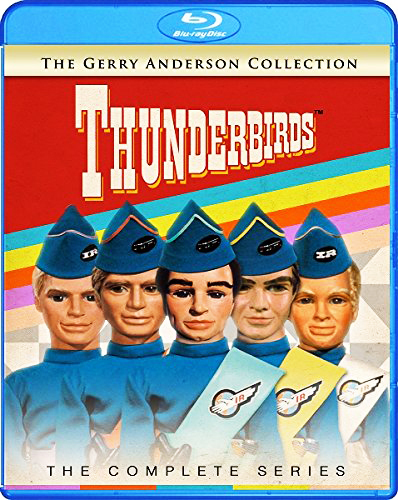 Like other series from British puppeteers Gerry and Sylvia Anderson (such as “Fireball XL5,” “Supercar” and “Stingray”), the 1965-66 color series “Thunderbirds” is better styled, written and “cast” than most bona fide movies starring actual human beings. The puppets may seem a bit silly at first, but the stories are so superbly crafted and “acted” that before long, you get caught up in the action and drama – and forget that you’re watching puppets. 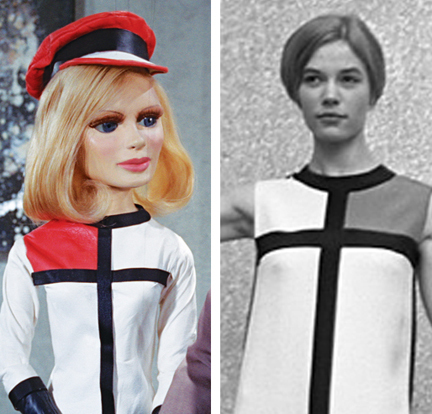 Lady Penelope, “Nosey” Parker and Brains round out the International Rescue team. Two more members of the crew are Brains, a soft-spoken engineer with a stutter and a knack for problem-solving, and Tin-Tin, beautiful daughter of the Tracys’ loyal butler Kyrano. (She has a little thing goin’ with Alan.) Grandma, who Jeff calls “Mother” when they’re alone, is a font of sage advice who can be resourceful in a pinch. Tin-Tin, Kyrano and Grandma play vital supporting roles at the Tracy homestead. 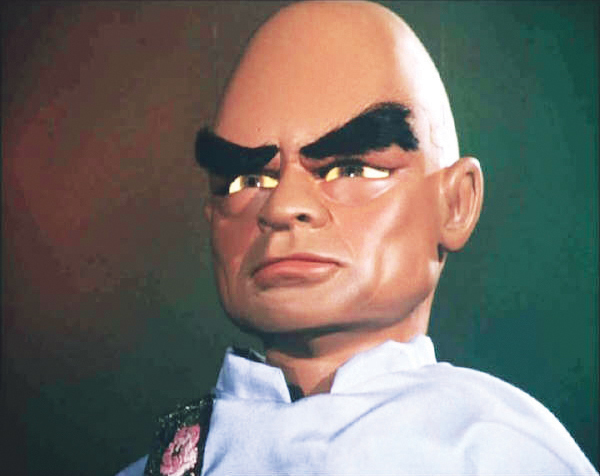 A recurring adversary – the Moriarty to the Thunderbirds – is the Hood, the half-brother of Kyrano. The Hood could easily be a James Bond villian. A master of disguise, the Hood handily infiltrates his opponents’ strongholds, even sometimes fooling we viewers — until his eyes begin to glow. There’s a whole lotta vehicles, machinery and pyrotechnics – something that will delight 8-year-olds of all ages. Composer Barry Gray’s movie-ready score is, again, worthy of 007. “Thunderbirds” is a trip. The many monolithic vehicles of “Thunderbirds” will delight 8-year-olds of all ages. When the Hood’s eyes glow — watch out! The first 20 minutes of “The Mighty Atom” anticipates “The China Syndrome.” Reporters touring a nuclear power plant in Australia are assured that nothing can go wrong. Then everything goes wrong (courtesy of the Hood). There’s a meltdown, followed by a mushroom cloud. Officials are stymied as fallout approaches Sydney. “Attack of the Alligators!” combines small, live alligators and miniature sets to create a passable monster movie. The episode is more convincing than a lot of real movies that used the same effect, such as “The Giant Gila Monster” and “Beginning of the End.” It’s also a cautionary tale about … Frankenfood! “Give or Take a Million” is the “Thunderbirds’” heartwarming Christmas episode. (It’s also the series finale.) Scenes of the Tracys and visitors decorating, gift-wrapping and baking for the holiday are silly and sweet. Shout! Factory has done its usual thorough, conscientious job with this release; the prints pop in groovy ’60s colors on Blu-ray. Extras include the featurette “Launching Thunderbirds” (presenting interviews with Mr. and Mrs. Anderson, voice actors and puppeteers) and a vintage publicity brochure in printable pdf format.